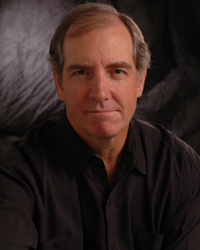 John Patrick Lowrie was born in 1952 in Honolulu, Hawaii and raised in Boulder, Colorado. At 16 he left home to make his way as a singer/guitarist/flautist/trombonist in a rock 'n' roll band, sleeping in parks and communes and getting to know several hippies. Surviving the draft, he graduated with highest distinction from the Indiana University School of Music and for a few years managed to make a living as a composer and guitarist in his acoustic fusion duo The Kiethe Lowrie Duet, garnering critical acclaim and opening for people who were much more famous than he was. He then decided to become an actor because the pay was better and the work was steadier. To this day he remains the only person he knows of who has done this. He met Ellen McLain, his wife of twenty-four years, in Arnhem, Holland on a European tour of a Broadway show and started his acting career in Palermo, Italy telling jokes to an opera house full of Sicilians who didn't speak English. Success continues to dog his heels like an angry Pekinese. John and his wife now reside in Seattle, where they divide their professional time between acting in live theater and voice acting for computer games and radio.